We chose to travel around the USA in a van not just for the convenience and ease of getting around but also because it’s very budget friendly. In the entire three months of travel (plus two months extra that we were in Vancouver) we only spent money on accommodation twice. Once at a hotel in Austin where we were hoping to pick up some post, and again in Las Vegas. The other 148ish nights we didn’t spend a penny on accommodation. 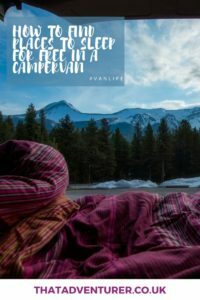 One of the biggest questions I had before we embarked on our vanlife journey was “where can I park my van overnight?”. I hate breaking rules. This means I kinda panic about where to park overnight and worry about whether someone is going to tell us to move. Once you’ve been doing it for a while you quickly learn to spot places to park up and sleep in cars or vans. 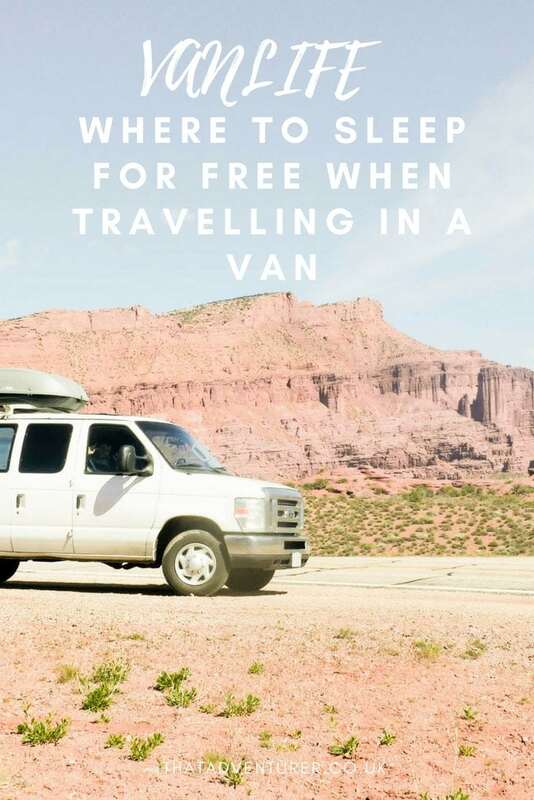 Now we just use Elvis the van for weekend trips and holidays but are pretty adept at finding places to park overnight for free. We quickly discovered that campsites in America really aren’t very good value for money. In many cases it would have been cheaper for us to book a night in a hotel than to stay in a campsite! There also wasn’t much point. Since we had installed a solar panel & Goal Zero we had all the power we needed. We had free water from places like this and having a plumbed in toilet and a hot shower isn’t that important. The BLM (Bureau of Land Management) have areas of land that are free for public use across America. Most of this is in the South West, and it’s not always free if you want to stay overnight. In Moab, for example, the campsites there were $15 a night for a pretty barren space with pit toilets. 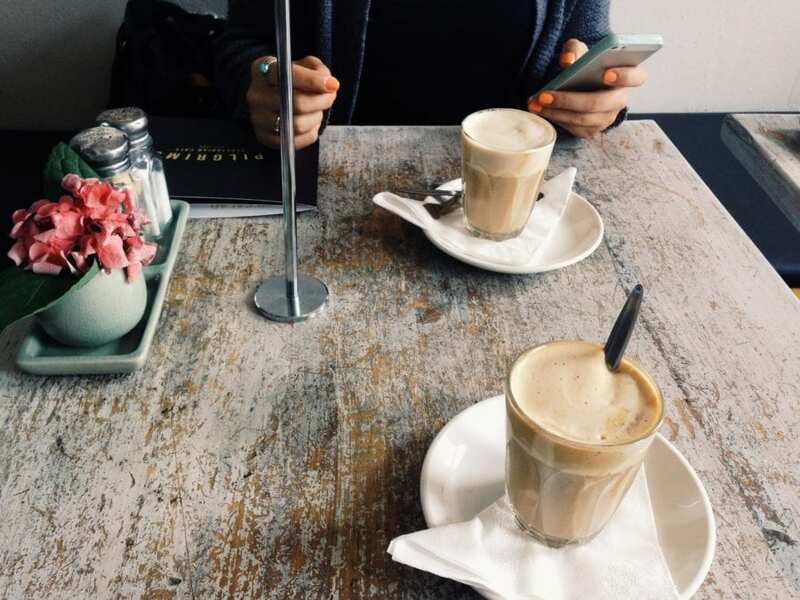 Whilst I was keen to stay somewhere where I wouldn’t worry about being asked to move on, I also didn’t want to spend $15 a night when I knew I could sleep somewhere else for free. These camping sites fill up fairly early in the afternoon but there’s normally some space you can squeeze into if you arrive in the evening. Expect no toilets or running water at most places – they’re just a patch of land. Finding a BLM map is notoriously difficult. We did find some good BLM camping spots through iOverlander. You can check out this page of the BLM website and see if you can make sense of it. Alternatively download Wandering Rhythm’s BLM Google Earth Overlay. Once downloaded upload it as a layer into Google Earth. There aren’t any facilities such as picnic tables, bins or toilets. Leave no trace and take out everything you take in. 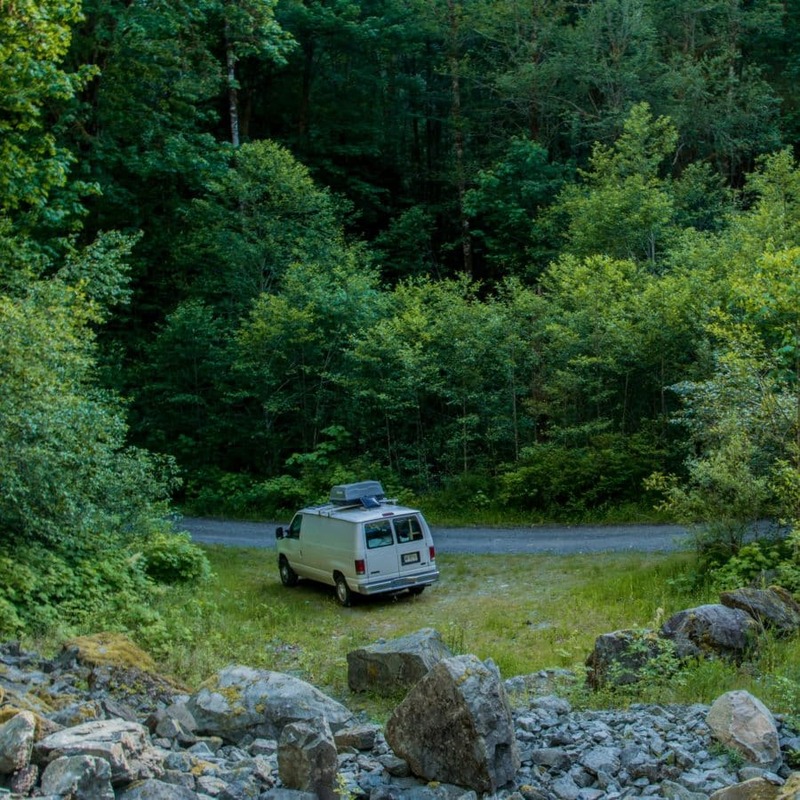 America’s National Forests are a Godsend for vanlifers. They’re completely free to stay in for up to 14 days a month (but double check). The first forest we stayed in was in Florida where I’m pretty sure a family and their several dogs had been living there for months, if not longer. We stayed in National Forest again several times and they were particularly useful when we were on the National Park section of our road trip. More often than not there’s National Forest land just outside the entrance to the National Parks which gives you free camping, right outside the National Park – closer than most of the hotels even! Free camping in the National Forests often involves driving down a dirt track for a little while. And, as with BLM land, camping pull outs in the National Forest get full pretty quickly and especially at weekends. You should be able to spot little pull outs from the road where there’s enough space to drive into and set up camp for the night. National Forests are well marked on Google Maps so unlike BLM land they’re pretty easy to find. You can also use the National Forest Locator or you can search depending on the state you’re in. Doing this means you can read up on the rules too which is a good idea since they’re different depending on area. National Geographic also has some maps that are specific to National Forests. This is super useful since you’re bound to be out of signal at least once while you’re trying to find where to park your camper van. There aren’t any facilities usually at these camp spots in National Forests. Remember to practise Leave No Trace principals. The Canadian equivalent of BLM Land is Crown Land. About 89% of Canada is Crown Land and it’s available to residents and non-residents (although they require a permit). You can camp on Crown Land for up to 21 days but there are many areas of this where you’re not allowed to camp. It can get pretty complicated as Crown Land is divided up into more categories which are managed both federally and by province which leads to different restrictions. But, since there’s such a large amount of it it’s still worthwhile learning about Crown Land and where you can, and cannot, park overnight. Canadian Crown Land varies a lot in terms of what to expect. Canada’s massive so it’s only to be expected! In BC you’ll typically see the places you’re allowed to camp are called “Recreation Sites”. Some of these you have to pay for and others you don’t. They tend to have little to no facilities. If you’re using a Rec. Site in the Lower Mainland (near Vancouver, BC) then expect it to be party central on the weekends and holidays; especially the free ones. This varies from province to province. Some have online maps which makes it a bit easier, others don’t really have much at all. I’ve listed a few resources below that’ll help you find Canada’s Crown Land. The map books are probably the most useful and we love our Backroads Map for Coastal BC. We love our Backroad map for coastal BC as it covers all of the areas we’d tend to explore in a weekend. It gives great detail on whether the road is suitable for cars without 4×4 capabilities too. We find this super useful since Elvis isn’t a 4×4 and we’ve had to turn around after trying to access somewhere on a dirt road before. 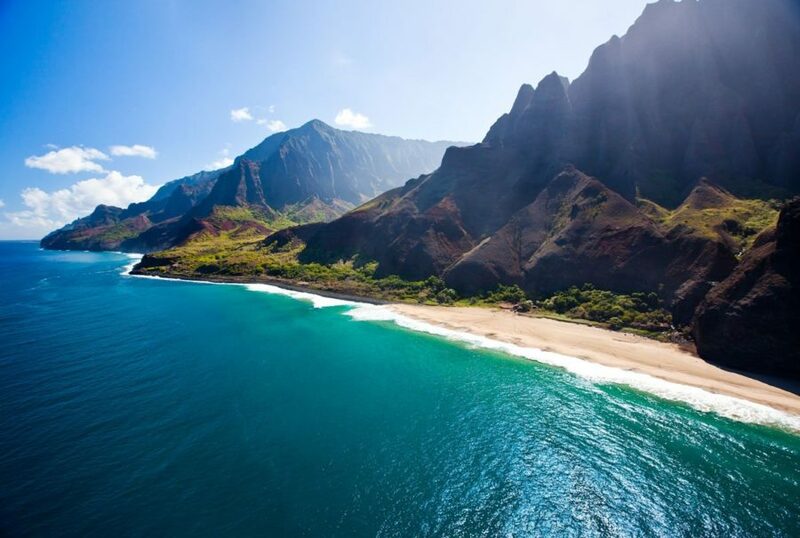 You’ll also find recreation sites in here too if you’re looking for places to overnight camp. They’re super detailed but this means that each book only includes a relatively small part of Canada. You’ll need several if you’re doing a lot of road tripping in Canada! As we travelled down the east coast in search of warmer weather (sleeping in a van at minus 20 is never fun no matter how much insulation you have! ), we did a lot of Walmart camping. Walmart know that RV owners and vanlifers visit them a lot. If you stay in their carpark you’re likely to buy something and for that reason many of them are okay with you sleeping in their car park. Just remember to be respectful. 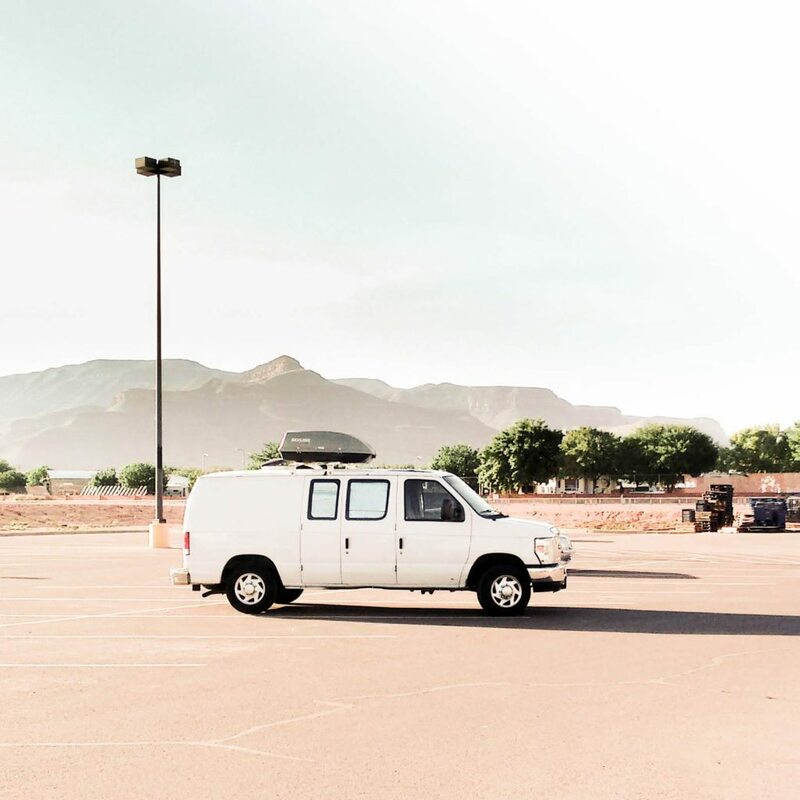 They’re so far removed from the Instagram #vanflife shots you see but they’re often the reality. Walmart carparks were great. Yes, sometimes they were noisy and occasionally you’d get asked to move on, but most of the time they were a fail safe option. We could pick up food for dinner, stock up on water for free, use their toilet and park our car during the day when we explored a city. Sometimes they had wifi and other times they even had some pretty good views like this Walmart in Almogordo. We definitely weren’t the only ones sleeping in Walmart carparks. 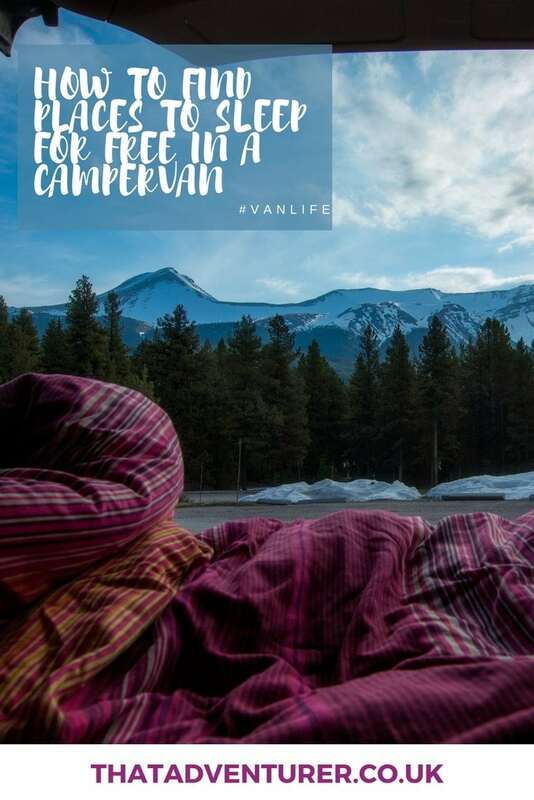 You’d see some people in massive RVs (sometimes they took it too far, in my opinion, and set up their camping tables and chairs, or played Frisbee across the carpark), people living in their cars and plenty more #vanlifers. Don’t take the piss. You’re in a carpark not a campsite. Don’t take up more than one car parking space and don’t set up chairs and tables. A lot of Walmarts have a security car patrolling at night. Mostly we found this was to keep an eye on the drunk/high people who seemed to set up camp in Walmart carparks. However, it’s also good to check with the security man whether you’re allowed to stay overnight. 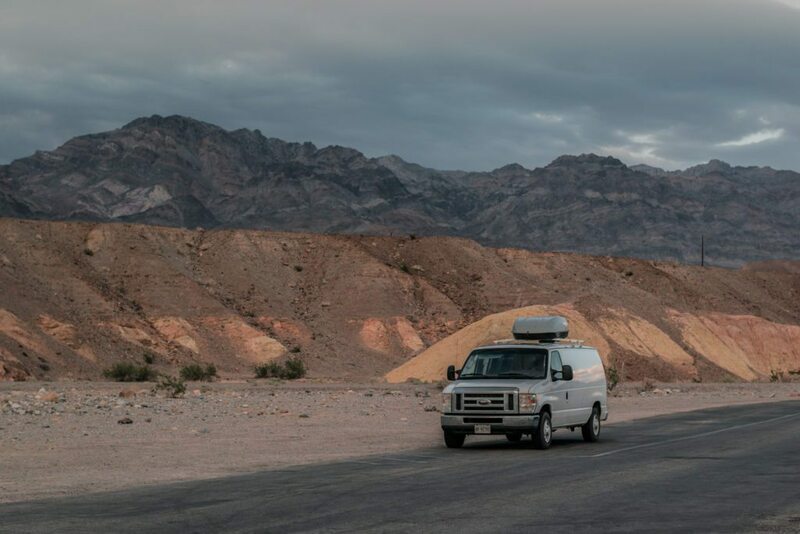 The ones we spoke to were always friendly – Thom even had a conversation about van conversions with one of them – and if you can’t stay then they’ll usually tell you about a Walmart where you can. Other RVs/camper vans in the carpark are usually a good sign you can stay. You’ll usually notice a corner of the carpark where there are several camper vans or RVs parked, if there aren’t any then chances are you’re probably not allowed to stay. The area of the carpark where the camper vans are is usually in the furthest corner from the main entrance where you’re less of a pain. Don’t park super close to the doors. 24 hour Walmarts are best. Not only will you being parked in a carpark look less weird. They’re more receptive to overnight campers too. Plus there’s a toilet should you need to get up in the middle of the night! If you’ve signed up to Planet Fitness like we did in order to shower, then you can usually get away with parking overnight in their carparks. We did this a couple of times during our road trip and had no issues. We’ve read that it works best if you get one of their Planet Fitness stickers to place on your van so that they know you’re a member. Despite the fact I’ve since read some pretty awful horror stories about rest areas I’m still adding them to this list. We stayed in a couple during our road trip and had surprisingly peaceful nights’ sleep. They were never our first choice and in some states you are prohibited from staying over night or limited to 8 hours at a time (which you can usually stretch out to 10/12 hours without issue). In Florida, all the rest areas had 24-hour security and you’ll find other rest areas with security too to give you that extra peace of mind. 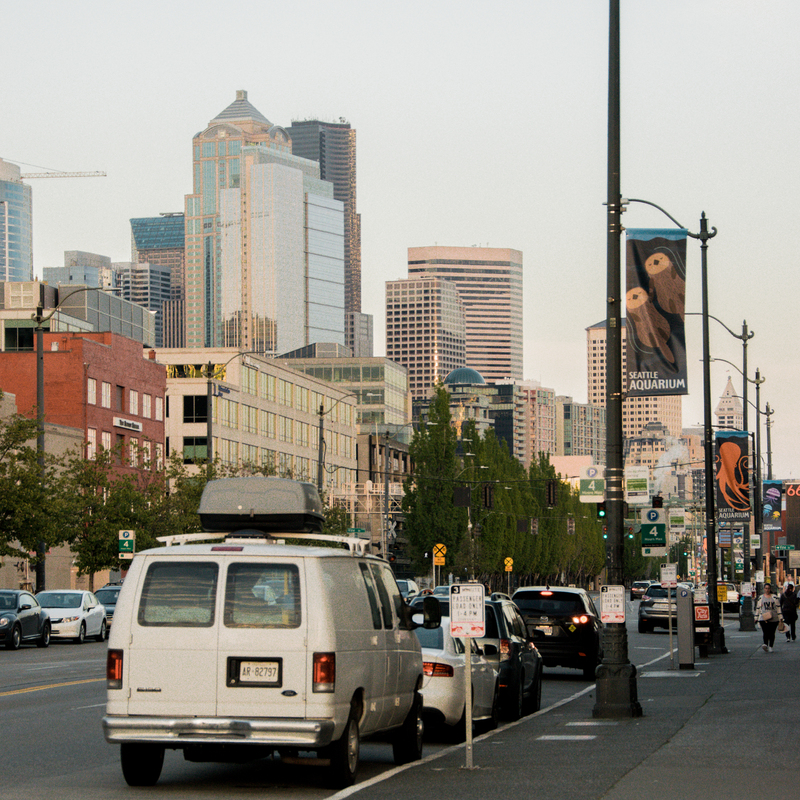 As you’d expect, finding free camping in a city was the hardest. It’s still not impossible though! We camped on the side of the road many a time during our trip. This is probably harder to do if you’re in a big RV but I’m sure it’s still possible. We liked to pull our curtain across in the evenings and put our covers in the windows to make it less obvious we were in the van. Make sure to read the parking signs properly as you don’t want to wake up to a fine on your windscreen! When we couldn’t find a Walmart we stayed in other carparks. These included Home Depot carparks; Rona car parks (a couple of times in Toronto and Niagara), Planet Fitness as above, park and ride and church carparks! I’ve also seen a lot of people talking about casino carparks. Casinos seem pretty open to having you stay in their carpark as they expect you’ll come in during the evening and gamble a bit. Most of them ask you to register your vehicle and some even give you free casino chips when you do! If all else fails just drive until you see a spot that doesn’t have a “no overnight camping” sign. If you get asked to move just say sorry and move on! Behind the Youth Centre in Klamath, CA – free wifi and water! A rest area with free coffee, tea and biscuits! 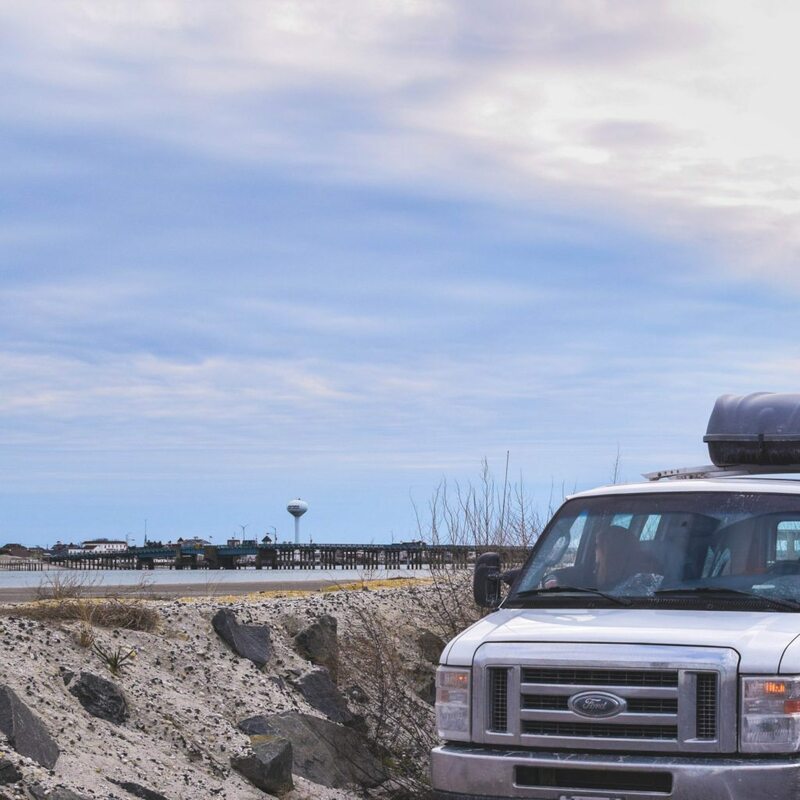 We used iOverlander pretty much every night of our USA road trip when we were looking for places to park and sleep. It’s an app and website that’s full of free places to park overnight. It also includes paid options, but you can filter down the results to just informal and wild camping which was what we did. You have to pay $10 for this app and honestly I got everything I needed from iOverlander when it came to finding free overnight parking near me. I’d say this is more useful if you’re travelling in a big RV and can’t be as stealthy as we were with Elvis. Campedium is a great camping resource that helps you find an overnight camp. You can search by states, national park and more. You can then read reviews, see pictures and learn about things like campground’s mobile coverage too. People tend to leave very detailed reviews of the camper parking on this site which is super useful. This was another one I didn’t use that much but it can still be useful if nothing turns up on the above sites. This site is good on desktop/laptop but they also have an app you can download. Not every place to overnight camp is free but it does tell you the price of a night’s camping. Just be aware that these might not be 100% uptodate! If you’re travelling through the US then this website will be super useful. This lists all the campsites in the National Forests. Most of them are paid but they tend to be much cheaper than the campsites inside American National Parks. 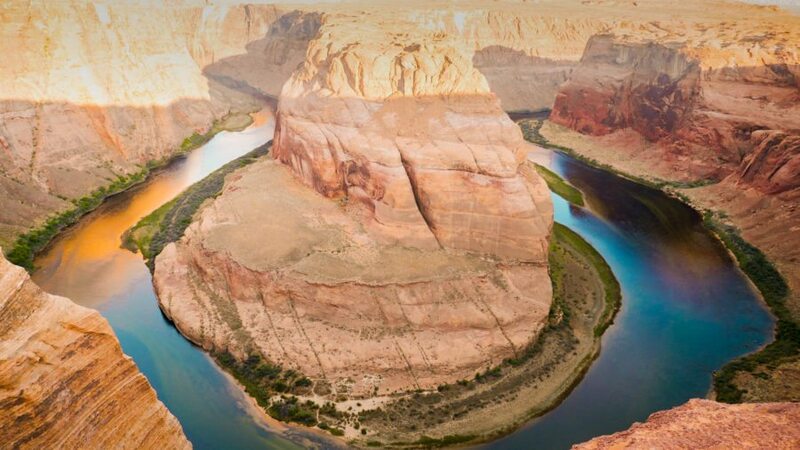 In Western US you can stay in public lands. The campsites on this website are all places you pay to park overnight. However, you can filter the map to only show BLM land or National Forests. 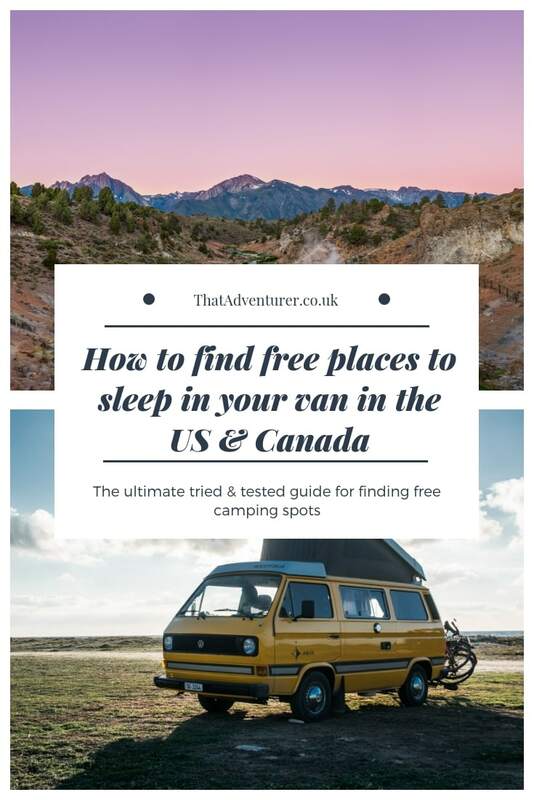 In both of these you’re allowed to camp for free in your van so it’s a good website to use to find those spots. I came across this while looking for places to park for free during the day in cities. It’s something I’d used before in the UK but then forgotten about. Anyway it’s actually a super useful tool to find free places to park overnight too. You can input how long you want to stay, between what times (ie. 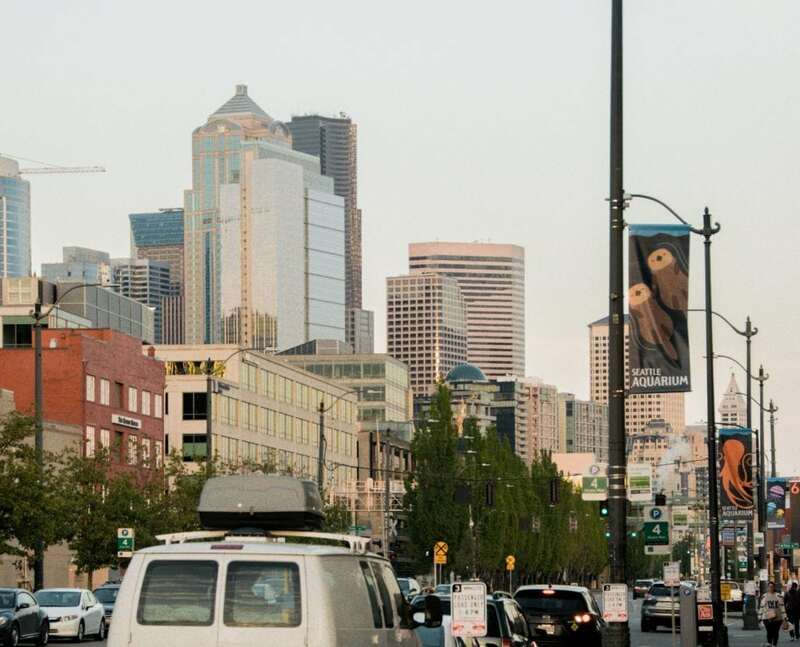 overnight) and the site will show you places you can park for that long, and who they’re owned by. The best ones are going to be those that aren’t covered/underground and aren’t owned by a big company. I’d try the other sites first but if you’re really stuck then take a look at Parkopedia. I love stealth camping! We have a Ford Transit Connect and it doesn’t look like a camper at all (it looks like a work van) so we have been able to park up on suburban streets, city car parks etc without any trouble. Our best spot recently was in a brewery carpark only 1 mile from the entrance to the Albuquerque Balloon Fest – we woke up at 5am and cut straight into the line from the carpark! This looks like an amazing thing to do! One question that was on my mind while reading this, though, is how much did you spend in gas? I’m sorry if that’s an odd question. I had no idea that there were so many free places to park! This would be so useful for a cross country road trip. Hopefully one day – thanks for the information. There are SOO many once you look in to it. We only paid for accommodation once (& that was a hotel when we needed to collect some mail) in 5 months! Enjoy Australia! Some of the apps are probably still useful like iOverlander.